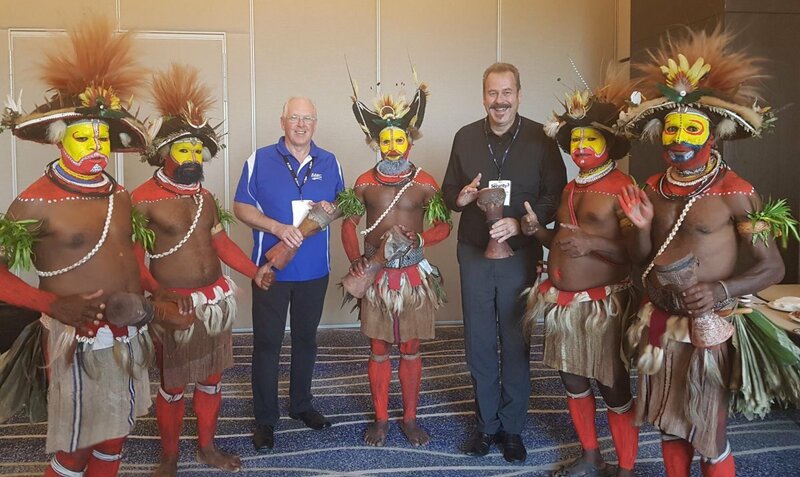 Pictured above are Richard Wilson, CEO of AARC Systems and Wayne Trethowan, General Manager of Consolidated Security Merchants being welcomed by PNG warriors in traditional dress. 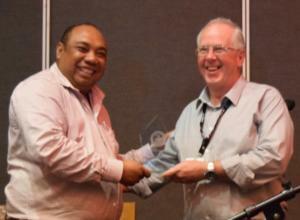 Alfredton, VICTORIA, 21st March 2019: AARC Systems, a Ballarat-based, tech startup and maker of the innovative, wireless-linked emergency alert system, AARC-EVAC, has won an international award at the 2019 PNG Security Congress, Port Moresby, Awards night, 6th March for “Best Product on Show”. The award was presented by the Hon. Jelta Wong MP, PNG Minister for Police to Mr. Richard Wilson, founder, and CEO of AARC Systems Pty Ltd, a Ballarat based company that designs and manufactures a world-leading, wireless-linked, emergency alert system, AARC-EVAC. At the opening address of the inaugural PNG Security Congress 2019, Police Minister Jelta Wong, called for increased public and private collaboration to achieve best security outcomes for PNG communities and businesses. Mr Wilson said that he “was honored to receive the award for ‘Best Product on Show’ that was voted by attending delegates”. “We had an enormous interest in our AARC-EVAC system on display at the congress expo from both private and government organisations. The AARC-EVAC emergency alert system brings together four different emergency alerts, duress, lockdown, first aid assist, & evacuation including voice alert messages all in one wireless-linked system” said Mr. Wilson. AARC-EVAC is a wireless-linked Emergency Voice Alarm and Communication system. Whether it’s a Duress alarm for you and your staff; a Lockdown system with coded audio messages; a multi-location First aid assist; or an Evacuation system with voice message instructions; these four key areas of workplace and community safety are addressed in one smartly designed, revolutionary wireless linked system.